Since the 229 is no longer produced, this review is mostly for information purposes. The 229 came on the scene in the early 1990s and its usefulness was almost doomed from the start as rapid improvements in battery lights was coming fast behind the 229 gas lantern. Today's LED lights are so much more efficient, powerful, smaller, lighter, and cheaper. 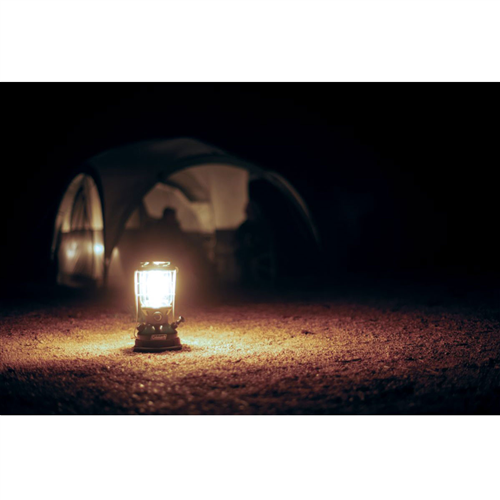 I still love the liquid gas lanterns for their nostalgia and the ambiance and warm heat that is familiar to my childhood years of camping with Dad and the family and the old Coleman gas lights. Later production 229 lanterns had cheap Chinese made globes that quickly shattered from the heat of the mantle with normal use. My solution was to replace the glass globe with a screen mesh globe. The 229 is a little smaller than the traditional Coleman double mantle lanterns (about half the size), but the 229 is not really small enough for backpacking and you can easily bring a full size double mantle lantern if you are car camping. So, the smaller 229 does not provide much advantage for car camping. Still, the 229's compact size does have its place for canoe camping or possibly kayak camping. 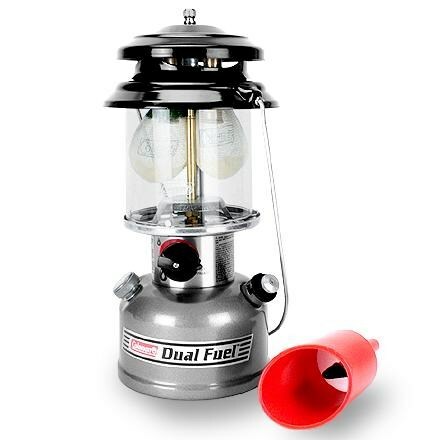 The function and use of the 229 is nearly identical to the traditional Coleman double mantle lanterns, so it familiar and easy to use and maintain. The Coleman Exponent 229 was famous for needing frequent pumping and I also found it needed to be pumped every 15 minutes or the light would dim and "pulse". This frequent pumping quickly becomes tiresome at camp. All in all, I mostly left the Coleman 229 lantern at home; using a full sized double mantle lantern when car camping and using LED lights for backpacking. I do bring it canoe camping occasionally, but not so much mostly due to the frequent pumping needs. By the way, I now use the standard #21A mantles with my Exponent 229 lantern and they work fine. The REAL mantles for the 229 were, I believe, the #20. The #21A is readily available and cheaper than the #20. Just tie the mantle sock as high as you can above the normal position on the generator goose-neck mount. UPDATE: After reading that some folks were able to get 90+ minutes run-time without re-pumping their Coleman Exponent 229 and the nearly identical Coleman Peak 222 lanterns, I recently took out my Coleman Exponent 229 lantern to see if I could tweek it to run without pulsating for more than 15 minutes. I WAS finally able to improve run time. The single biggest improvement was by adding about two tablespoons of "Sea Foam" automobile fuel cleaner/additive to the lantern tank. I have only used Coleman fuel and never used automobile gas in my 229 lantern, so I believe there may have been some solvent or lubricant or moisture from manufacturing that got into the lantern. The other thing I did was to back off of the fuel lever until it was at the minimum setting for the BRIGHTNESS I wanted. My 229 does not dim—it is on or off, but when I got the leaver to the point of on/off, I toggled it a bunch of times just to see if it might clear or improve. It really did not, but it seemed to make sense to set the brightness level to just the edge of where it needed to be in order to prevent using up the tank pressure (and fuel) quickly. This activity plus the Sea Foam allowed me to get a 90+ minute run-time without re-pumping. This was the first time in the 20+ years that I have owned the lantern that it ran more than 15 minutes without re-pumping. Hurray! I have owned my Coleman Exponent 229 for about twenty years. Until I figured out how to make and use a screen mesh globe to replace the glass globe, the 229 spent a lot of time in storage because the glass globe was so frequently broken and in need of replacement. Thanks for sharing your experience with this lantern, Mike. I'd love to see some pictures of it, if you're willing to share some in your review. Alicia, I certainly will be happy to post some photos. I will take some and post later. It will show the DIY screen mesh globe. Thanks, Mike! And thanks for the update, too. Hello out there...This lantern does more than I expected from it. So small and still very powerful. And the pieces are available if you ever need to replace one. Some say you have to pump it too often.Well, this lamp is only 24 cm tall. Hey, what do you expect dude. You like it because it's small and it delivers A LOT of light. But yes, you will have to pump it sometimes. Considering it takes about 15 seconds to do it, that's a very good deal. To me, it's a very good product and I used it a lot already. Thanks. Pros: Bright, compact in terms of white gas fuel lantern. Cons: have to pump it every 15-20 mins. It is very troublesome. More or less the condition in other model 229 Coleman lanterns. I just received this lantern from a friend in the USA (I live in the UK). It's a very small lamp, only 9.5" tall, holds about 8oz of fuel. Well made, lights very easily, and throws out a massive amount of light for its small size. It will burn Coleman/unleaded petrol, and a full tank gives around three hours of burn time at full output. Small enough for a side pouch on a backpack. I'm looking forward to using it on one= or two-night trips. A highly recommended bit of kit. 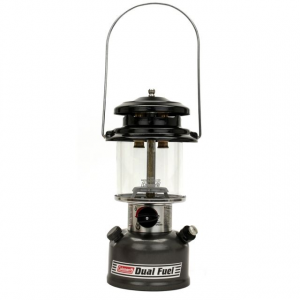 The 229 Exponent Dual-Fuel Lantern has been discontinued. 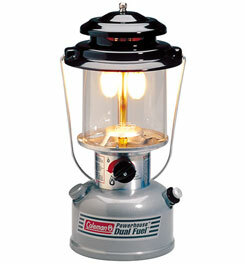 It was replaced by the Coleman Premium Powerhouse Dual Fuel Lantern. 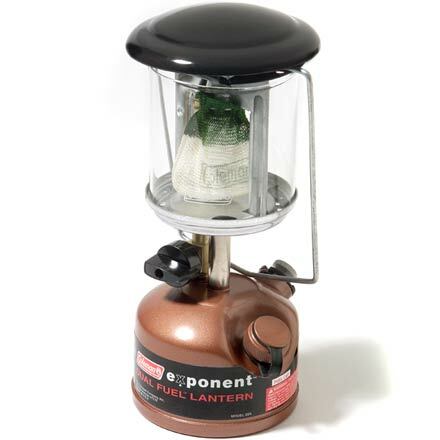 The Coleman 229 Exponent Dual-Fuel Lantern is not available from the stores we monitor. It was last seen January 9, 2012	at Campmor.